Got a new SEO gig that should go really well as it a fairly niche set of keywords I have to work with. 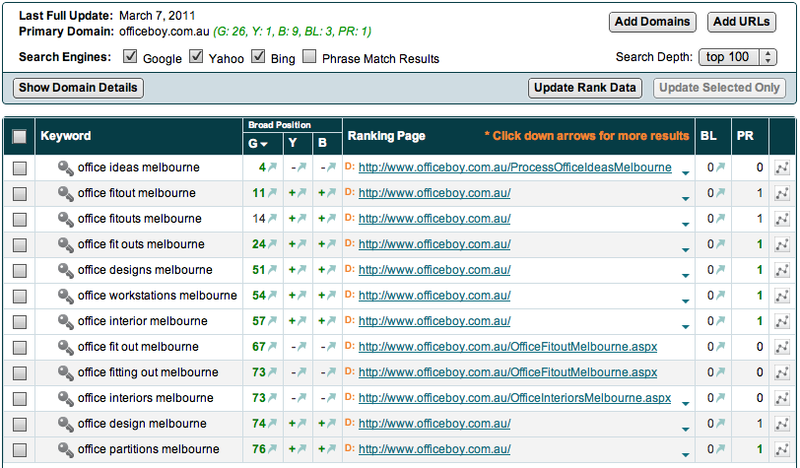 Below are the main ones, but I really want to focus on the “Office Fitouts Melbourne” key phrase as many of my keywords are variations of this phrase and it is the first one that come up in Google’s predictive search results. Here is what I got when I ran the current data through my Market Samurai program. Kind of a blank canvas in terms of SEO. But that is what I like to work with, the only way is up. Amazing what a couple of weeks can do in terms of Google positions. I am hoping Bing and Yahoo also come to the party. But for now, things seem to be moving smoothly. You will probably notice the backlinks have vanished from the second screenshot due to a change to Yahoo Site Explorer, which is causing a few headaches for the good people who make Market Samurai. 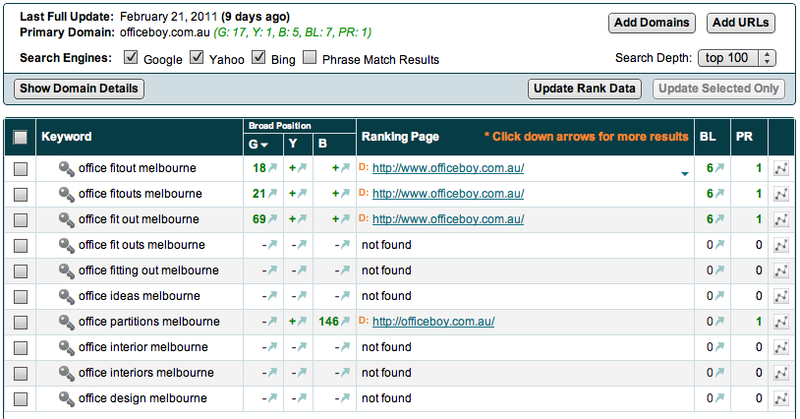 Couple more weeks and I should have a few more page one results for these keywords. I have purchase two great keyword domain names which I hope to setup with a bit of Adsense and Chitika ads. The domains I got were keyword related which I am going to whip up a quick free site with Weebly. Wow! nice results!! Contact me on the email address attached to this comment. I would love to talk to you about a strategy for our website which also deals in office fit outs.